The All Progressives Congress, APC, in Benue state has accused the Peoples Democratic Party, PDP, of disrupting their governorship campaign rally on Friday, in Gbajimba, Guma LGA of Benue State. 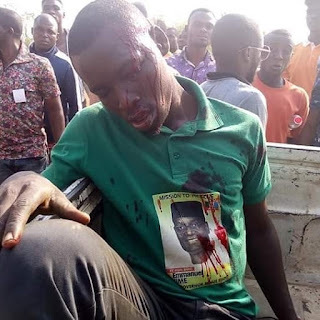 But the PDP has rather stated that the Gbajimba violence was carried out by the APC and led by two of their members who violently assaulted PDP supporters and burnt down campaign materials belonging to the incumbent Governor, Samuel Ortom. Ortom has also insisted that he is innocent and did not send any person to disrupt or stop the APC rally. Gbajimba is the village and home town of the incumbent governor Samuel Ortom. Briefing Journalists in Makurdi, Secretary Emmanuel Jime campaign Organization, Professor Eugene Aliegba said trouble started when suspected political thugs allegedly loyal to the PDP, disrupted their governorship campaign rally in Gbajimba. He said the campaign team had gone there in continuation of its governorship rally and while addressing the people at a particular venue, armed youths stormed the venue and started throwing stones at them. He explained that security men were called in to disperse them only for them to regroup and come back again throwing stones and shooting sporadically with AK47 injuring several people who ran in different direction for safety. Prof. Aliegba further explained that before their movement to Gbajimba, Guma LGA, they had it on good authority that Gov. Ortom had already mobilized PDP members not to allow APC hold any rally in the area. According to him, the organisation decided to put the rally on hold and informed security agents. A chieftain of the APC and one time Head of Service in the state, Mike Iordye also said the PDP chairman of Nzorov Council ward was specifically instructed not to allow APC hold any rally in the area and so, he mobilized thugs to disrupt the rally. "As early as 6am on Friday, PDP thugs gathered around the roundabout on Garibaldi wanting to stop the rally. One APC and PDP supporter was arrested following a fight that ensued between them.